On every doorpost in most Jewish homes, there is a parchment scroll containing two excerpts from the Torah (Deuteronomy 6:4-9 and 11:13-21) called a mezuzah, encased in a cover of wood, metal or other material. Dating back to Mosaic times, the mezuzah is a symbol of devotion to the Almighty and the recognition that all else pales before Him. 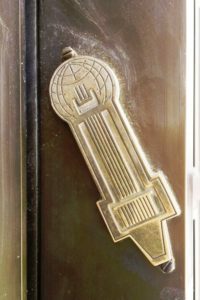 The mezuzah dedicates our home as a Temple of God and reminds the occupant of his position –'occupant'—since God is the true owner of everything. When we enter our home, we place our hand upon the mezuzah to remind ourselves that we are treading upon consecrated ground. When we leave our home, we place our hand upon the mezuzah and commit our home to His protection. Motivated by a deep sentimental attachment to her early childhood experiences of her father's holding her in his arms to reach up and 'kiss the mezuzah' on her doorpost at home, Dr. Belle Rosenbaum began collecting 19th and 20th century mezuzot from across the world in 1940. Believing that mezuzot were the 'jewels of the home' and that they represented the one mitzvah associated with an object that involved everyone—men, women and children, Belle's lifelong efforts to locate and showcase thousands of the most artistically unique of these ritual items were inspired by her deep love and devotion to her faith and her commitment to perpetuate her glorious heritage for generations to come. Jacob, Z"L, and Dr. Belle Rosenbaum have generously donated thousands of mezuzot from their collection to The Jerusalem Great Synagogue, where they remain on permanent display in the Maurice and Vivienne Wohl Entrance Hall. In 1808, a congregant of Reb Nachman, the venerated Rebbe of Breslov, presented him with a gift of a magnificent throne chair. It was a masterpiece of gloriously carved images of biblical birds, animals and floral garlands entwined in a tree of life. After the Rebbe's demise, the chair was hidden and preserved by his followers until 1936, when it was dismantled and smuggled out of communist Russia, piece by piece, to the Breslov community in Palestine. In 1985, the Breslov Chassidim (Hassidic sect of followers) approached the noted Israeli artist Catriel Sugarman with the wormy remnants of the chair that had decayed over the decades, and requested that he restore it. While many of the fragments were too putrefied for assemblage, Catriel reconstructed many of the elements with consummate artistry. After the chair's reconstruction, Belle Rosenbaum asked Catriel to create a mezuzah for her collection from the discarded fragments. The Breslov Chassidim, zealously guarding every splinter, fervently rejected the request initially, but eventually agreed to allow Catriel to design this mezuzah. The worm tracks are clearly visible on the delicate case. Belle met 'Shalom,' an elderly man selling mezuzut from a makeshift display counter, at the Ain Hod artist's colony in Israel in 1965. His mezuzot tell the compelling story of spirit unbroken and of the triumph of the Jewish people and their heritage in the face of adversity. Before World War II, Shalom lived in a small town in Poland where he made his living by writing parchments for mezuzot and other Jewish ritual objects. When the Germans rounded up all the Jews in his town to deport to concentration camps, he managed to hide some small parchments and a pen on his person. After arriving at the camp, he vowed to write as many mezuzot as possible and to distribute them to each barrack where they were placed in hidden crevices behind doors. In order to preserve the mezuzots' inner parchments properly, he managed to obtain brown paper bags which he tore into squares in which to wrap them. To ensure that the parchments would not fall out, he twisted both ends of the paper to hold it. Shalom was the only survivor of his family, all of whom perished in the smokestacks of the crematoria. When he arrived in Israel in 1950, he began to resume his former career as a scribe. He designed the mezuzah case depicted here to honor the memory of his beloved family and friends. It is constructed of black iron to recall the smoking chimneys of the crematoria. The design, measuring 7" x 3/4," commemorates the twisted brown paper he used to enclose the parchments he wrote in the camp which helped sustain many inmates through their agony.